It is so perfect, so picturesque, so darling that it doesn't seem possible. 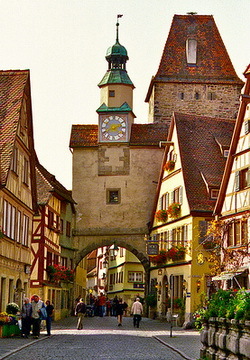 Rothenburg ob der Tauber, is considered the most perfect walled city in Europe. Even if you've never seen it, you've seen it, at least in imagination. It's the ideal setting for every fairy tale the Brothers Grimm ever recorded. It's where Disney would have housed Snow White, where Cinderella might have found that lost slipper. Half-timbered houses lean across narrow lanes, 500-year-old balconies spill with geraniums, old cobblestones gleam in the afternoon sun, and there is no neon, no kitsch anywhere. 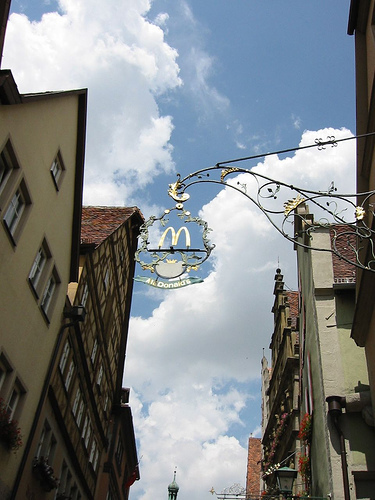 Even the local McDonald's hides in a Gothic facade, its only advertising a subtle gold M wrapped in lacy wrought-iron, as discreet as its neighbors' golden swords (a weapons shop) and golden griffin (a guest house dating from the 1300s). Miniaturized, you could put Rothenburg under a Christmas tree. And some people do: It's among the prototypes for the ceramic Christmas villages that have become hot collectibles in North America. 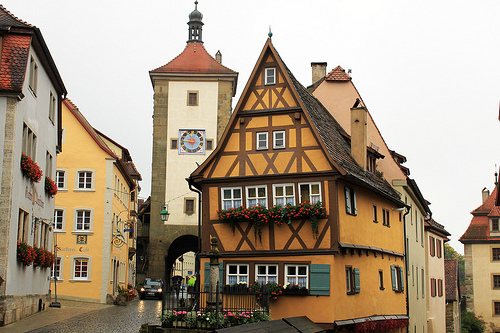 Rothenburg is a joy to walk around, with half-timbered medieval houses with high gables, defensive towers and a marketplace where shepherds danced around wells to ward offplague. From the wooden walkway on the city walls, the red roofs of the picturesque town and the steeples of the 14th-century St Jakobus church stretch below. Former castle battlements, now gardens, overlook the river 55m below, across from the southern walls and towers of the old town that wind around the edge of the valley. That Rothenburg is so well preserved owes much to the centuries of depression that followed the devastating 30-year war between Catholics and Protestants in the 17th century. 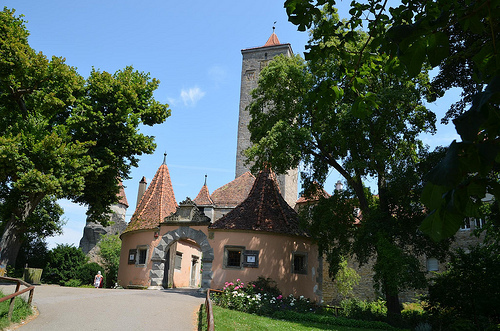 A walk in almost any direction in Rothenburg brings visitors to something interesting. The Eisenhut, or Iron Helmet, is probably the best-known hotel on the Romantic Road. It's made up of four former patrician houses and has a terrace on the Tauber. From Rothenburg most people on the Romantic Road seem to drive slowly, as if they don't want to leave it. Perhaps they just want to look back one more time . . . and then another. © RothenburgObDerTauber.org - All Rights Reserved!